It's not too early to start planning to attend the Annual Safe & Civil Schools National Conference this summer in Portland, Oregon! Our 15th Annual National Conference is scheduled for July 10–14, 2011 at the elegant Hilton Portland. For information about this year's sessions and presenters, visit our website. Or download a brochure. If you're going to the NASP Annual Convention February 23–25, come visit us! This year, Pacific Northwest Publishing will join us at the conference. We will be in booths 610 and 612. Pacific Northwest Publishing is also sponsoring the San Francisco Welcome Party on the opening night of the conference, February 22 from 9pm to 12am. The party will feature food and entertainment organized by local NASP members. And you won't want to miss the special event hosted by Pacific Northwest Publishing to introduce two new innovative tools. Bill Jenson will launch Superheroes, a unique and validated social skills program for children with Autism Spectrum Disorder. Randy Sprick will demonstrate how TRENDS, a new student data management system, can guide PBIS efforts with a comprehensive system for collecting and anylyzing schoolwide, classroom, and individual student data. Come to this special reception Wednesday, February 23 from 7pm to 9pm for valuable information, beer, wine, and hors d'oeuvres! Both Safe & Civil Schools and Pacific Northwest Publishing will be at ASCD this spring. The conference will take place at the Moscone Center in San Francisco from March 26–28. We will be exhibiting in booths 2113 and 2115. If you're planning to attend one or both of these conventions, please stop by our booths. We'd love to chat with you about we can do to help you create safe and caring environments in your schools! On February 9, 2011 at 2pm EST, Randy will present a 90-minute webinar on "A Practical Team Approach to Behavior—Implementing Early-Stage Interventions." The webinar, sponsored by CASE, is designed for general education teachers and administrators as well as special education teachers, administrators, and supervisors. Register at www.casecec.org. Safe & Civil Schools is on Facebook! Visit us on Facebook for the latest news on Safe & Civil Schools. Access special discounts, find out what our staff is doing and thinking, and share your thoughts with us! The latest from Bill Jenson and colleagues—Superheroes Social Skills: A Multimedia Program. Using a unique combination of Fast-Hands Animation, Peer Modeling Senarios, and Digital Comics, Superheroes is an evidence-based program that teaches and motivates children with autism, some behavioral disorders, and developmental delays to interact positively with others. TRENDS, a revolutionary new PBIS data management system developed by Dr. Randy Sprick and colleagues, enables educators to track referrals, encouragements, notifications, discipline, and safety. TRENDS incorporates PBIS by enabling educators to assess climate and safety, adjust classroom management plans based on student behavioral data, and access hundreds of proactive behavioral intervention plans. Our additional focus on positive referrals (Commendations) supports a positive rather than punitive school environment. There will be a presentation on both Superheroes and TRENDS at the NASP Convention on Wednesday, February 23 from 7pm to 8:30pm. If you're attending the convention, come learn more about these innovative new tools! And don't forget to visit the Pacific Northwest Publishing website for information about other books and materials for educators on positive behavior interventions and supports (PBIS) and Behavioral Response to Intervention (BRTI). Are They Making the Grade? Whether you are working with semesters, trimester, or quarters, toward the end of the term or the beginning of the new term you will want to determine whether your students' attendance, punctuality, in-class work completion, homework completion rates, and academic work are satisfactory. By conducting a grade book analysis, you can look at this data and decide whether you need to implement a plan to improve any areas of concern with your class, a small group of students, or individual students. Such an analysis can also help you determine how variables may interact (e.g., when his attendance rates drop, Johnny misses more homework assignments). If you do not have a computer grade book, calculate data for each student in your class. Attendance: Divide the actual number of days each student has been at school by the total number of days school has been in session. Punctuality: Divide the actual number of days the student arrived on time by the total number of days the student has been in attendance. In-class work completion: Divide the actual number of in-class assignments the student has turned in by the total number of in-class assignments that have been due. Elementary teachers should make these calculations for students across all academic content areas. Homework completion: Divide the actual number of homework assignments the student has turned in by the total number of homework assignments that have been due. Elementary teachers should make these calculations for students across all academic content areas. Calculate grades for each student in your class in each graded subject area. 2. 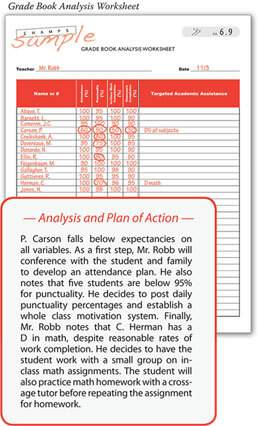 Enter data for each of your students on a Grade Book Analysis Worksheet like the one in CHAMPS, 2nd ed. (PDF sample shown here). 3. In the Targeted Academic Assistance column, record any unsatisfactory grade and its related subject. 4. Analyze your results. Does your data indicate a problem with your class or individuals? Attendance: Students should have at or above 95% attendance, missing no more than 2 or 3 days per quarter or 4 to 5 days per semester. Punctuality: Students should be at or above 95% punctuality. In-class work completion: Students should be at or above 95% in-class work completion. Homework completion: Students should be at or above 95% homework completion. Targeted academic assistance: Students should be passing all academic subjects. Schedule a discussion with the student. Schedule a discussion with the student and family members. Establish an individualized plan for the student. Discuss the problem with your principal, special education teacher, school counselor, school psychologist, or district behavior specialist. By performing a grade book analysis, you can quickly identify those students who need help and then devise an intervention to help them boost their performance before the grading period ends. Excerpts from CHAMPS: A Proactive and Positive Approach to Classroom Management. Tim Morrow, Assistant Principal at South Hagerstown High School in Hagerstown, Maryland, assures us that their Safe & Civil Schools implementation is doing well. Prior to implementation, SHHS experienced high volumes of tardies to class and school, students roaming halls during class, no consistent hallway supervision, and frequent hall incidents including fights. After one year of implementing Safe & Civil Schools strategies (gleaned from workshops and by networking with peers at our National Conference), personnel at SHHS are working to address all of the above issues—and they are succeeding admirably! Tardies, referrals, and suspensions are down from the previous year (2008-09). The number of fights has decreased by 28 percent and incidents of physical aggression (shoving, threats, etc.) are down by 20 percent. According to the report Mr. Morrow sent us, "the programs made a significant and positive impact at SHHS." South Hagerstown High School (SHHS) in the Washington County Public School system serves a diverse student body of about 1300 with more than 60% of students on the Free or Reduced Lunch program. U.S. News and World Report recognized SHHS the last three years as a bronze level school in its top 500 schools and the school consistently meets AYP goals. Congratulations to the staff and students at SHHS! At Safe & Civil Schools, we recognize the effort you have made in making your school a safer, more civil place.